CLEAR YOUR CALENDAR – IT’S GOING DOWN! YOU’RE INVITED TO TAKE PART IN THE SHATTERDAY FESTIVITIES. COME ONE, COME ALL, BRING A GUEST, AND HANG LOOSE. THIS IS GOING TO BE EPIC! 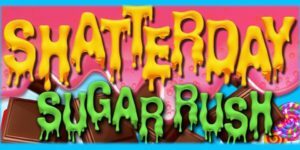 Join Terpy Solutions X KushcakesDC for DC’s Shatterday SugarRush! Enjoy Dope vybes, Live DJ, All-You-Can-Dab, Infused treats, Vendor Expo and MORE! OVER 200 GIVE-AWAYS AT THE DOOR for the early birds in the building. RSVP FOR SECRET LOCATION! ADDRESS WILL BE SENT 24HRS BEFORE EVENT TO REGISTERED EMAILS! REGISTER NOW, BEFORE ITS TOO LATE! Ticket Options are LIT! – RSVP to receive $5 off $15 Cash Door Admission, includes FREE DAB OR FREE TREAT, your choice! – ONLINE GA Ticket includes One Free Treat from @DcCloudEvents AND Unlimited Dabs from @TerpySolutions! – ONLINE VIP Goodie Bag includes Assorted Gourment Edible Treats, Premium Flower Pre-Roll AND Unlimited Dabs! SHARE / REPOST TO WIN FREE ADMISSION! No really, if you share this event we will send you a free ticket! 3. Message us with a screenshot of your repost and your email! 4. Receive your free admission voucher via email! This event is PRIVATE- Requires guests to RSVP, Purchase Ticket or be acompanied by someone with a ticket!